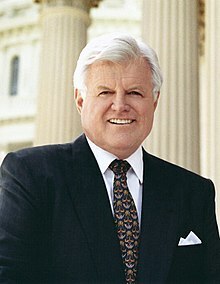 Edward Moore "Ted" Kennedy (Februar 22, 1932 – August 25, 2009) wis a Unitit States Senator frae Massachusetts an a member o the Democratic Pairty. He wis the seicont maist senior member o the Senate when he died an wis the fowert-langest-servin senator in Unitit States history, haein served thare for awmaist 47 years. Ted Kennedy wis the maist prominent livin member o the Kennedy faimily for mony years, an he wis the last survivin son o Joseph P. Kennedy, Sr. an Rose Kennedy. He wis the youngest brither o Preses John F. Kennedy an Senator Robert F. Kennedy, baith victims o assassination, an the faither o Congressman Patrick J. Kennedy.